If your business is, well, “in the business” of processing high volume, complex print jobs then speed and accuracy are essential. Updating your digital press workflow is an excellent step in meeting your customers’ requirements, but it’s not a one-step enhancement. A successful digital press operation will require regular evaluation and tweaking so as to maximize the experience for the customer and the efficiency for the organization. Here are 6 steps to improve your digital press workflow. 1. Identify weak points in your workflow, from job receipt to pre-flighting, pre-press and production. First and foremost, you must have a complete understanding of your current digital press business practices if you wish to create a new, improved workflow system. You accomplish this through in-depth analysis. Items like equipment, software, employee performance and production volume should all be looked at. Remember that it will likely take observing more than just one job to get an accurate idea of any performance gaps. The ultimate goal here is to pinpoint exactly where the inefficiencies or performance gaps occur. These areas of opportunity usually have a snowball effect, so if you’re not catching, stopping and fixing each issue as you come to it you may not be operating as smoothly as you could be. Next, you create new systems and put them in place. You finish up by monitoring the new systems and looking for more ways to improve. 2. Determine which points of your digital press operation can best benefit from automation based on the technology available. Diversification is the name of the game, and frankly, it’s a blessing and a curse. Digital press production isn’t about running off a million copies of a single project anymore. They may still want a million copies, but they’ll likely ask for 50 different variations at 20,000 copies each. For a digital press operation, this process could tie up a lot of personnel and equipment, and before long, these shorter run jobs can become an efficiency killer. Automation reduces the need for administrative personnel, and when it comes to workflow, automation reduces errors and increases productivity through the elimination of manual and repetitive tasks. 3. Leverage the technical expertise of your organization. Also take advantage of vendor expertise to help create a more flexible and dynamic workflow that addresses the pain points in your operation. One mistake that I’ve seen a lot of companies make is they’ve sold their employees short. They assume that if their existing workforce was capable of fixing an issue they would do it long before the company would need to turn to an outside vendor. That’s frequently not the case. Many workers recognize areas of opportunity, and they often know better than anybody how to fix them, but they simply don’t have the resources they need to make the improvements. In most cases “resources” means money and/or equipment and software. Canon production printing digital press equipment and software automation can help you make the most of those areas of opportunity. So, if the technical experts in your organization or your vendors happen to bring up Canon resources, do yourself a favor and listen to them. 4. Reduce physical touch-points throughout your operation while maintaining better control and clearer monitoring of each process. Simply put, the fewer hands that touch a project, the less probability there is for mistakes. That’s the beauty of an automated operation. Once the digital press system is dialed in for a particular type of job, employees can sit back and focus on monitoring the process, tweaking and adjusting as new projects roll in. Spending a few minutes at the beginning of the operation to make sure everything is properly prepared should save a considerable amount of time as the operation rolls on. Employees won’t need to engage in as much time consuming manual work like fixing or tweaking. This, in turn, will allow them to move on to new projects, making the organization more efficient and more productive. 5. Implement workflow software that can be upgraded as your organization’s needs change. “Future proofing” should be a serious feature that any organization looking to upgrade or improve digital press workflow holds in high regard. The software should be flexible enough that it can evolve seamlessly as the business continues to grow, flex and breathe. It should be modular and allow for pieces to be added as you need additional capabilities. Responsible companies should regularly be asking themselves if a process can be done better. If the answer is “yes,” the workflow software needs to be able to keep up with the changes and roll with the punches. When shopping for production printing equipment and software tools like Canon production printing systems, it’s important to bring up the issue of software upgrades and future proofing for your digital press technology. 6. Consult with customers to ensure that your internal changes help to address their needs. 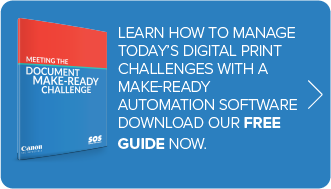 Chances are your customers don’t care much about your organization’s software upgrades, workflow enhancements or in the case of a digital press, the level of automation in your daily operations. What they do care about is a quality product that’s delivered on time and in a condition that meets (and hopefully exceeds) their expectations. That’s why it’s important to consult with your customers to see if they’re getting the best experience possible. A successful digital press operation needs to be able to take that customer feedback, interpret it in a way that makes it relative to specific operational elements in the business and ultimately tweak those elements to better meet the customer’s needs. Whether you’re the manager of print production for central reprographics or a print shop that does in-house printing and mailing for a medium or large company, chances are you’re processing bulky, complex jobs with varying requirements. There’s no time for slowdowns caused by inefficient manual processes associated with your digital press operation. Following the 6 steps above (and repeating them often) can help ensure that your organization is staying as efficient, productive and profitable as it possibly can be.